1. What is going to landfill from Tauranga that could be directed to composting or recycling instead? 2. Who are the 5 stakeholders in the system and what is their impact on consumer behaviour and on the generation of waste? 3. Why is the order of the words in the phrase “Reduce, Reuse, Recycle” so important? 4. What 7 practical changes we can make to improve our current situation? 5. What are the pros and cons of a rate-payer funded kerbside rubbish collection and mixed recycling wheelie bin collection? 6. What are the components of the ultimate recycling system that would divert the most material away from landfill? 7. What else would you like to know about my recycling ideas? 8. Test Yourself: How many points can you get for your recycling, and waste-reduction efforts? 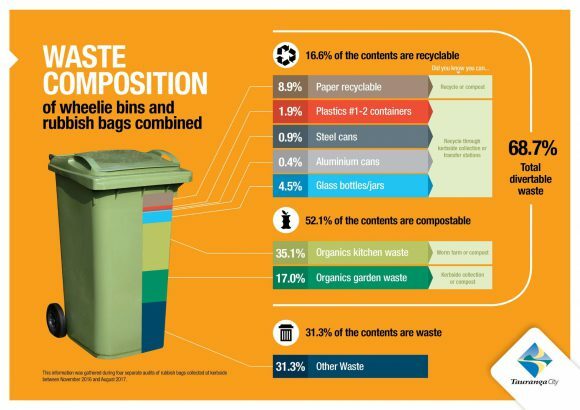 Let’s start by taking a look at what we throw into our rubbish bins as a city. This is good news because it means there are lots of improvements we can make that will make a big impact. My ideas for dealing with this waste make up the bulk of the following content. 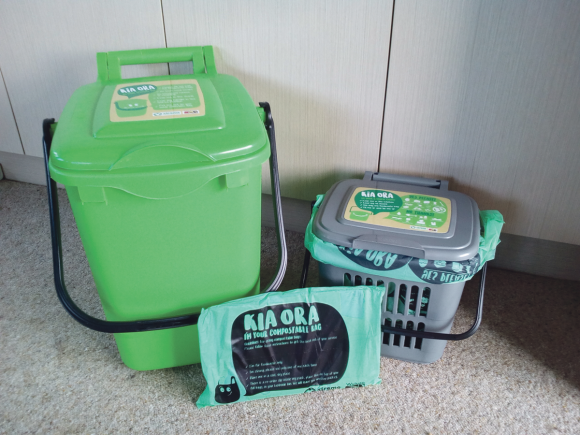 Did you know that Tauranga’s waste is scooped up from our 2 transfer stations (Maleme St + Te Maunga) loaded onto trucks and driven 156km to Hampton Downs Landfill (Google Maps) which is mid way between Hamilton and Auckland, for burying in landfill? Surely we can do better? Decisions made at a council level have huge impacts on the behaviour of residents, consumers and organisations, on the private businesses that operate in the waste industry. So let’s make these changes carefully and set ourselves up for long-term success. You might have heard that phrase before, but have you taken a moment to consider the order of the words? “Recycle” is last on the list for a reason. 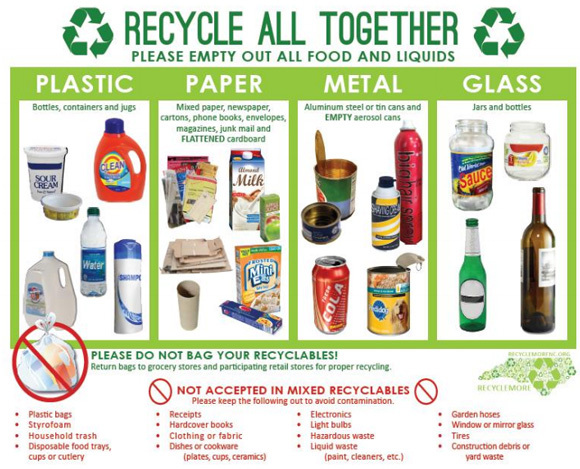 Recycling is great, but it’s actually a last resort before throwing something into the trash. Even better is to re-use items as often as you can to extend their usefulness. Have you noticed that sometimes the price to fix an item can be close to the price for buying a brand new one? That’s a benefit of mass production and economies of scale, but it does tend to create a throw-away society. I support the councils proposal to provide rate-payer funded kerbside glass collection in 45 litre crates (but I have a few concerns to share with you, see below). Will the tendering process be fair? Did you know that 40% of the glass we were putting into our mixed recycling bins went to landfill and did not get recycled? Those contaminated items go straight to to landfill because shards of glass aren’t acceptable to the glass companies, and cardboard and paper studded with glass is not acceptable to the pulp companies. These 4 chances to break means that 40% of the glass we were putting into our mixed recycle bins in Tauranga was not recyclable and went to landfill instead. Why didn’t we separate glass sooner? Why didn’t the council see this coming? The council staff who specialise is waste minimisation did recommend separating glass in meeting minutes going back several years. But because the problem wasn’t a problem at the kerbside no action was taken. It’s good that the contractor refused to let this broken system go on so we get a chance to fix it. I support the councils proposal in the Long Term Plan 2018-2028 to provide rates-funded, kerbside food-waste collection service by 2020. Did you know that food waste is 50% of the weight of our household rubbish? How Raglan does it: http://www.raglanchronicle.co.nz/community/2017/08/1766. The council is proposing a switch to rates-funded rubbish collection in wheelie bins. I do not support this service being rates funded but I do support the switch from plastic rubbish bags to wheelie bins. Why are wheelie bins a better idea? What’s a better way to fund this collection? You pre-pay for collection with tags that you secure to the handle each time you need a pick-up. The collector cuts these tags off when they arrive. I support Marty Hoffarts idea of petitioning the government to create a refundable beverage container deposit scheme. Why is the refundable deposit scheme a good idea? Even if we do have the convenience of kerbside collection as proposed above. It’s not perfect. Some people will illegally dump their rubbish, throw about recyclable materials into their general rubbish, throw bottles from cars into bushes or into waterways, or leave piles of bottles in playgrounds at night. How do we get those recycled too? By making them valuable. By making them worth 10c each with container deposit legislation. The same should be done for car tyres by adding a $5 disposal fee to the price of new tires. See Marty Hoffarts 2014 TEDxTauranga video on this. With the charge for rubbish taken to our transfer stations set to just $10 per tonne, dumping our rubbish instead of diverting it to recycling is cheap and easy. If we set this closer to Australia’s rate of $140 per tonne, we would be highly motivated to divert and change our behaviour. The additional revenue from this change could be used for cleaning up public dumping (which is likely to increase), and investing in further improvements to our recycling systems. Here are 4 major sectors that need their waste streams improved. Each sector would benefit for additional education, but figuring out who pays for it is an issue (this is another reason why the refundable deposit scheme works so well because financial incentives are the easiest to communicate). How do we fund this? Incentivise participation with a competition with prizes? Work with associations to create industry specific competition for environmental sustainability? Charge a nominal fee for audits (enact a bylaw to ensure compliance)? See the next section for what I’m proposing instead. Stockpile it at home and take it to the transfer station for free recycling once every 6 month. Its flat, it’s clean and dry. Q: Are you proposing any changes to Greenwaste collection (multiple private companies)? Q: Is it true that China is no longer taking our recyclable material and governments around the world are stockpiling? Q: Is it true that “compostable” plastic food containers and cutlery are little better than plastic? Q: Why doesn’t everyone recycle? They are used to buying rubbish bags a few at a time for a few dollars. Q: Is it true that cotton or paper bags are not much better than plastic? If they stay dry, they last a long time in landfill. But they are less damaging if they end up in the sea. Find out more: Are cotton or paper bags really better than plastic? Q: Where does each type of material actually go for recycling? It’s actually quite hard to find a definitive answer for this question. As information comes in, I will continue to update this section. There’s lots to do, but together we can get it done. Vote Sheldon Nesdale on to Tauranga City Council. This entry was posted in Research Projects and tagged recycling by Sheldon Nesdale. Bookmark the permalink.